The Natural History Museum's yuletide goodies are comment-worthy. 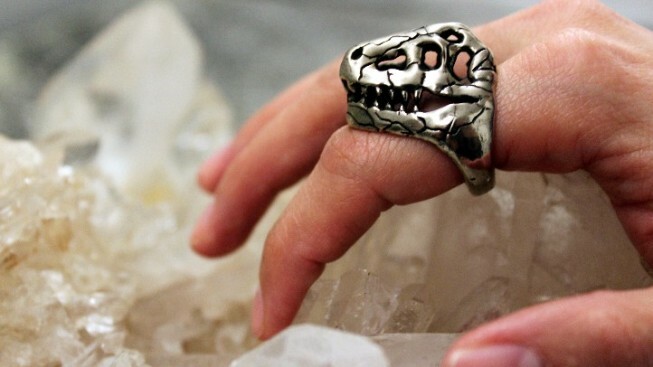 Buy your very own T Rex ring at the Natural History Museum. Doing our holiday shopping at local cultural and scientific institutions is a December given, right? We want to support the places we visit throughout the year while finding the best and most offbeat goodies for our giftees. And if the person you're tasked with buying a present for loves a certain museum? Well, you just saved yourself a lot of driving around and needless fretting. We always make a point to point out the Natural History Museum's shop around this time of year, especially given that they've got smartie-smart kid stuff. But our favorite item this year is not for the children. It's all for us, er, we mean, the person we are shopping for. Yep, it's the T Rex ring. It's white bronze, it can be worn by the ladies who love their dinos or the men (read: it's unisex), and it is $124.99 bucks. We're not saying this should be an engagement ring, but if you choose to make it one, and the person you're proposing to loves his or her paleo-history, well. Then. You are the coolest person ever. Fact. There are other more traditional and oh-so-pretty things, like geode necklaces, and kid-nice toys. But if the idea of an extinct, reptilian predator sitting on your finger as you type your emails doesn't cheer and charm you, er. We can't finish that sentence because we think it probably charms the heck out of everyone.